Weddings are what we do best! Over the years, we have had the honor and pleasure of taking many couples from wedding day visions to beautiful wedding day realities. It may seem like a short amount of time that will pass in an instant, but to us it is a full day of great memories just waiting to happen. The right Master of Ceremonies (MC) and Disc Jockey (DJ) is the key to unlocking ALL the potential within every wedding reception. As we have heard from too many times to count, “it’s the DJ that makes the wedding.” We like to think you know that! We feel that your MC/DJ is one of the most important, if not the greatest investments you will make when planning your reception. For us, being the MC/DJ you want doesn't just happen with a few simple announcements and playing a couple party tunes, but by taking your ideas along with what we have learned from our years of experience to make your wedding day truly memorable! The many unsolicited “thank you’s” that we receive from our Brides and Grooms say it all. Wedding Planner – This easy to follow form allows you to outline all of the details, big and small, that are important to you. It includes special songs as well as timing and sequence of events throughout the day. Music Requests – Songs, both fast and slow, that you wish to have played. There’s also a place to list the songs you wish not to have played which are equally as important. 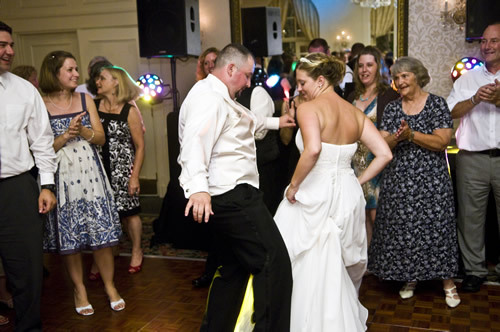 Musical Selections – A compilation of songs categorized by theme such as Father/Daughter and Mother/Son dances, Bridal Party dance, cake cutting, & last dance. Sample Music Guide – Just a small portion of our library, this 40+ page list contains Classic Party Tunes, Top 40, Country, Latin and much more. As there are no two couples alike, we believe that there are no two weddings alike. As the most visual, vocal and accessible person in the room, we believe out Master of Ceremonies skills are extremely vital to the success of your celebration. We speak in a confident, eloquent, clear and precise manner to ensure that your guests are kept informed of all events throughout your reception. All names are always pronounced correctly no matter how eccentric they may be. The success of your reception takes more than just pressing “play” and watching what happens. Certainly the tempo, volume and selection of music will match the atmosphere that you have asked us to create. But as Professional DJs, our dual role is to bring the many parts of your reception together so that they flow seamlessly. The role of DJ/MC takes not only good preparation but also continuous attention to all of your details, big and small. From the first introduction to the very last dance, we have the responsibility to keep the party going while you concentrate on having the time of your life!